Russia said deceived the German concern. Russia supplied gas turbines produced by German Siemens to Crimea, which is subject to EU sanctions, which prohibit European companies the supply of energy technologies to the Russia-occupied peninsula, Reuters reported with reference to three sources familiar with the project. The agency was unable to establish whether the delivery of the equipment was carried out with the knowledge or consent of Siemens. However, a German company may be under the threat of a potential accusation of violating the sanctions regime and that it has not taken sufficient measures to prevent its equipment from entering the territory of the annexed Crimea. Russia is building two power stations in Crimea with a total capacity of 940 MW for $ 1.3 bn. The supply of Siemens turbines to these power plants earlier this year was frozen due to the risk of violation of sanctions. It is unclear whether new circumstances have emerged that allowed the turbines to be delivered to Crimea now, and whether the supply will be treated as a violation of sanctions if Siemens did not participate in it. "Siemens did not supply turbines to Crimea and complies with all export restrictions," Siemens representative in Munich, Wolfram Trost, said in response to a request to confirm the transfer of the turbines to Crimea. Referring to the confidentiality, he did not answer Reuters' written questions about whether Siemens knew that his turbines were sent to Crimea and whether the concern would participate in their installation and maintenance. A source close to the project told Reuters that two of the four turbines were delivered by sea to Crimea. According to him, they are intended for use at the Sevastopol power station. The turbines were unloaded at the port of Sevastopol, and work was done on the station site for their installation and launching, he said. 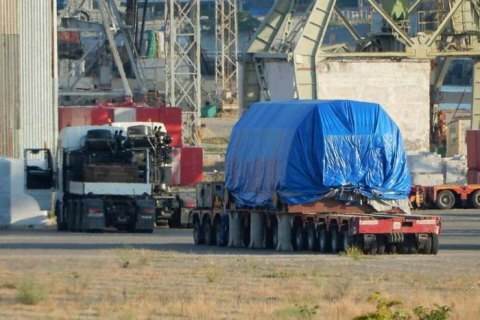 The source said that the turbine model SGT5–2000E was delivered to the port of Sevastopol. The turbines of this modification are manufactured only by Siemens and its subsidiaries. An official working in Crimean energy sector, familiar with the progress of the projects, and an employee of the company participating in the construction also said that Siemens delivered turbines to Crimea. Direct export of equipment to Crimea to European companies is prohibited, but it is not completely clear how the delivery of equipment by third-party firms will be regarded without notifying the manufacturer. Two sources – one close to the project and an official in the energy sector of Crimea – told Reuters that the turbines were delivered to Sevastopol from the Taman Peninsula in the south of Russia. Earlier in March, Siemens told reporters that the Russian plant in St. Petersburg, which he controlled, supplied turbines for the planned project in Taman. Four gas turbines were produced in a joint venture with Aleksey Mordashov, the Siloviye Mashiny, the Siemens Technologies Gas Turbine plant in St. Petersburg and were delivered to Taman under a contract with Tekhnopromexport. Siemens owns a 65 percent stake in the joint venture, Power Machines has 35 percent. Russia itself does not produce gas turbines of medium and high power. The ban on the supply of technology to Crimea does not apply to Taman, but the project was not implemented there, and Russia is preparing to announce a new tender for generating capacities there. Sources close to Crimean projects, previously told Reuters that one of the options considered was the use of the turbines supplied to Taman. Siemens denied last year this possibility, insisting that the turbines are designed for the Taman project, and he has no reason to think that they will go elsewhere. The concern also claimed that it respected and did not intend to violate the sanctions regime. Lawyers with whom Reuters previously spoke believe that there are no court precedents to determine whether Siemens can be prosecuted for violations of the sanctions regime if a third party sends it to Crimea. The Russian agency RBC wrote referring to the source that the turbines were manufactured at the Siemens plant in St. Petersburg jointly with the Siloviye Mashiny but asserted that they were partially redesigned at Rostekh plants. "The degree of modernization is so great that the products can no longer bear the name of the manufacturer, this is a different product," assured the RBC interlocutor, close to the participant in the project. The Russian authorities planned that the 570 MW first stage of power stations in Sevastopol and Simferopol for will be put into operation in September 2017. The second stage with the growth of capacity to 940 MW is planned to be launched in March 2018.